4.6 billion years. 27,000 square feet of evolutionary exploration. Visitors dive into learning about the life forms that inhabited oceans during the Cambrian period. Learn about the evolution of life on Earth. The Tully Monster, discovered in Illinois and our state fossil! Visitors see SUE's fossil skull alongside a mural that recreates what SUE's world might've looked like 67 million years ago. Enter a Late Cretaceous forest and come face-to-face with one of the world’s most notorious predators. Alongside SUE’s skeleton, find fossils of creatures that lived at the same time, including Triceratops, small mammals, and fish. See T. rex in motion through a media experience that recreates South Dakota 67 million years ago. Already the largest and most complete T. rex specimen, SUE received scientific updates in 2018. We now have a more accurate picture of how a T. rex skeleton should look, including where SUE’s gastralia fit in. Resembling a second set of ribs in the belly, gastralia may have helped T. rex breathe. Earth’s evolution is about so much more than the extinction of the dinosaurs and our primate ancestors learning to walk upright. Imagine our planet in its earliest days: volcanic eruptions, crashing meteorites, and the first life forms taking shape. Begin your journey through time and explore each period of our evolution, including the Precambrian era that makes up 90 percent of the planet’s 4.6-billion-year timeline. 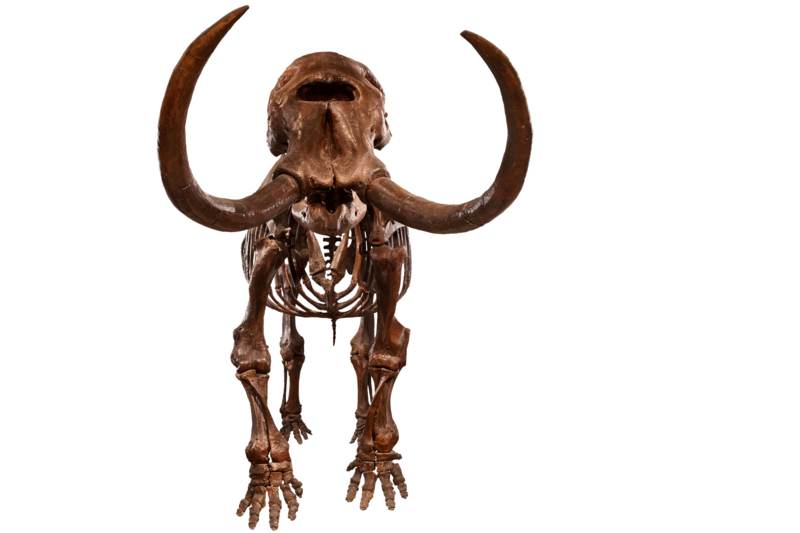 As the evolutionary timeline inches toward the present, you’ll examine the most recent ice age (we’re still living in it) and check out some of the most well-preserved fossils of this period. You’ll also learn why so many of today’s species are facing a mass extinction and the role you can play in their survival. Discover how mammals have evolved, and get a look at early horses, rhinoceroses, and more. The Griffin Halls of Evolving Planet are part of the Griffin Dinosaur Experience, made possible by generous support from the Kenneth C. Griffin Charitable Fund.